Which one of the following is not an Electronic Machine? AHard disk is known as the primary memory of the computer. B1 Kilobytes = 1024 bytes. CROM is a temporary storage device. DCD-RW uses bluetooth technology to write data on it. 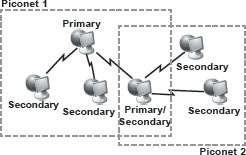 When different piconets are combined together in such a way that a secondary station in one piconet can be the primary in another, then what kind of network would be formed? Which of the following operations has been applied on selected portion of Picture-1 to convert it into Picture-2 in MS-Paint of Windows 7? ________ is a technology that adds graphics, sound and other effects to the natural world. It is best to download and run the _____ on your computer to analyze your system before upgrading in Windows 7. Which of the following steps is correct, if you want to insert these 'Stars and Banners' in your document in MS-Word 2010? Unscramble the given words and select the odd one out.